I have to be honest, there’s not many people I know who have travelled in Sudan. And being even more honest, there’s NO solo females I know who have travelled in Sudan. But you know what, this sort of unknown travel just spurs me on! So it was, in March 2018, I travelled to Sudan as a solo female. And what this has allowed me to do is answer the question “Is Sudan safe for solo female travellers?”, directly from my own actual experience. No hearsay, no media filter, no false perception. 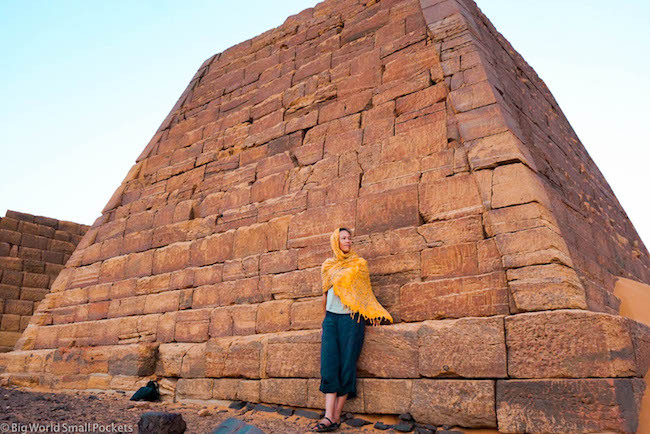 The first point to make when replying to the question about whether Sudan is safe for solo female travellers (or any travellers for that matter) is to point out that Sudan is an incredibly off the beaten track destination. There are hardly any other tourists around and almost no tourism infrastructure. Few local people speak English and the country is economically very downtrodden, which means conditions are basic at best. The last thing I want to do here is paint a bleak picture of Sudan (the reality is it’s anything but bleak), but it’s important any traveller, solo female or not, realises the facts about travel here. As an experienced traveller I relished the challenges Sudan provided, but even I, at times, found them almost overbearing. If you haven’t travelled in Africa a lot, or you haven’t travelled a lot by yourself, Sudan wouldn’t be my recommendation for your first endeavour in either of these fields. It’s more a country that you need to work up to, not least because you’ll spend a lot of time alone here if you visit solo and don’t speak Arabic – there’s just simply no other tourists around to talk to. 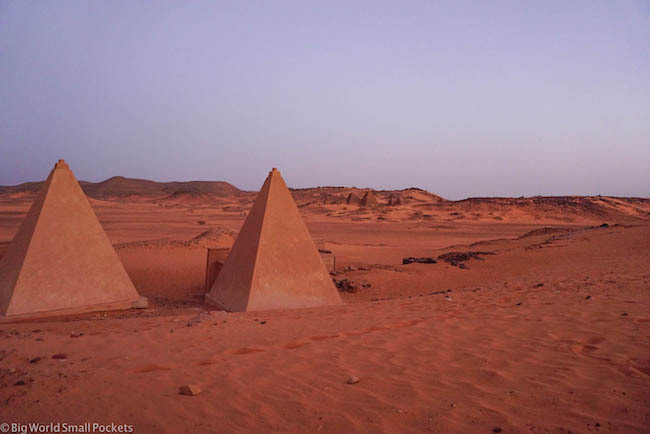 Equally, while the capital Khartoum, the town of Karima and the Meroe Pyramids have some western-style accommodation, outside of this transport, accommodation and food is basic in Sudan to stay the least. Again, maybe a bit of a shock for African newbies. None of this of course equals a lack of safety (apart maybe from a digestive point of view!) but they are valid points that need to be made if you’re thinking of travelling here, especially alone. 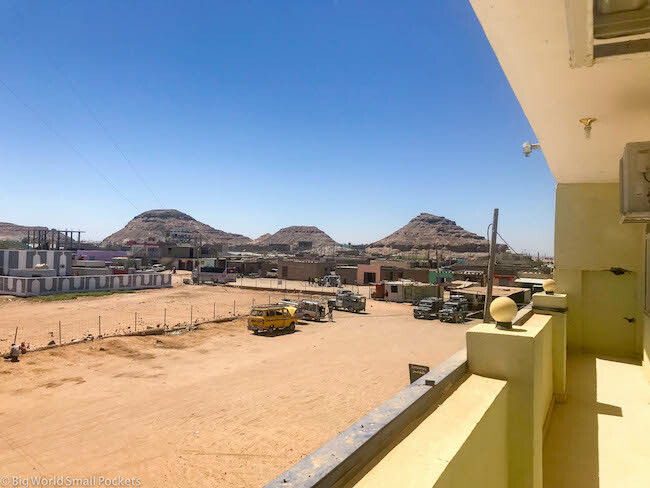 It’s also worth bearing in mind that communication can also prove difficult in Sudan with few people here speaking English – leading to frequent confusion if you’re trying to find buses, hotels, places to eat or generally what the heck is going on!! 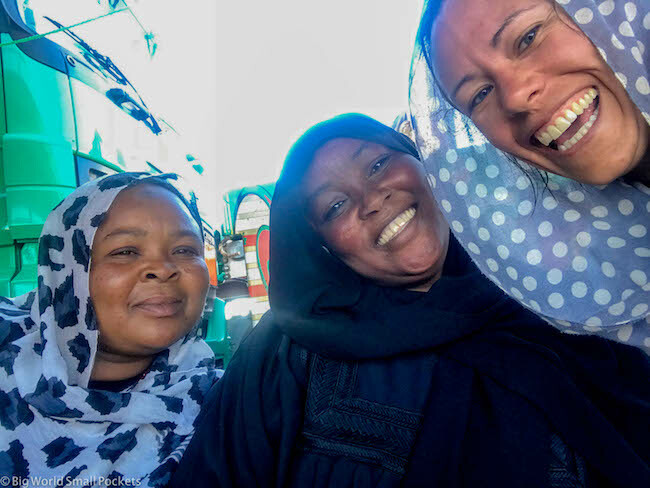 #1 Headscarf or Sarong – Female travellers especially may feel they want to wear a headscarf in Sudan to fit in. Although it’s not strictly necessary it may make life easier. #2 Long, Thin Trousers – Legs need to be covered in this strict Islamic culture, but due to the extremely hot climate, having a thin linen or cotton pair like this is ideal. 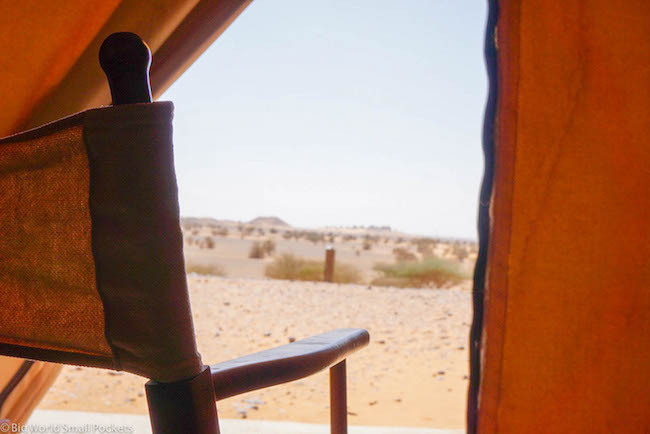 #3 Sunglasses – Did I mention Sudan was hot! Like 40 degree hot. Sunglasses are essential here to protect your eyes from the UV rays and the dust! #4 Long-Sleeved Thin Top – Like legs, arms should be covered in Sudan, so a thin long-sleeved top like this one is going to be necessary. 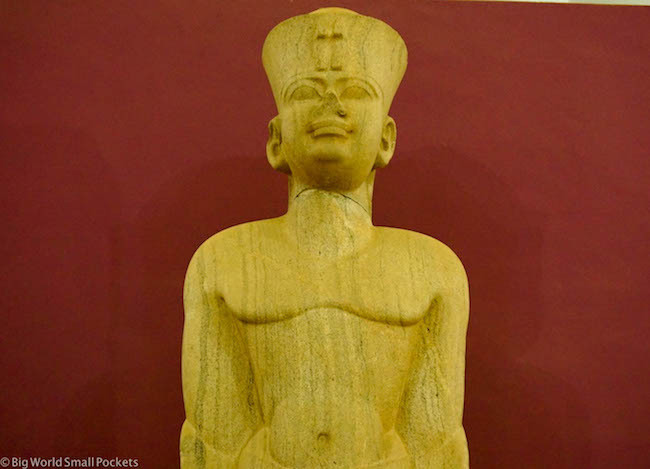 #5 Arabic Phrasebook – Even in the capital of Sudan, few people speak English, so getting your hands on the Lonely Planet Egyptian Arabic Phrasebook before you leave home will help you in this country no end! I guess another major point to note about travel in Sudan is the strict religious code of the country. At first glance, this isn’t directly related to whether Sudan is safe or not, but in a roundabout way it does impact it, which I’ll lead onto. With a conservative Islamic culture and Sharia law enforced, Sudan can be something of a culture shock for western travellers. No alcohol and very conservative dress standards are probably the 2 most immediately noticeable features of this aspect of life in Sudan. 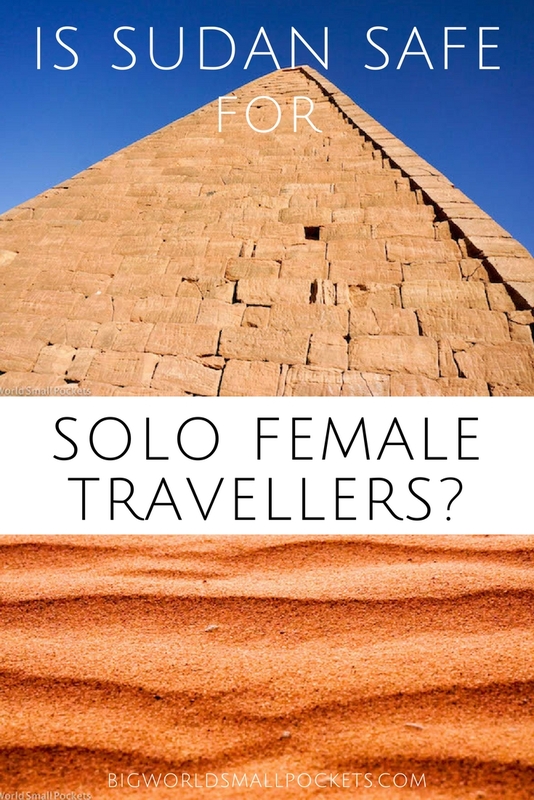 As a solo female traveller here, smoking in public and being out late at night alone or in the company of men is frowned upon and you won’t see any other local women doing either of these things. In line with local standards, I’d certainly recommend dressing very moderately – this includes long trousers or skirts, long sleeved tops and no low or exposing necklines. Men will want to follow suit too. 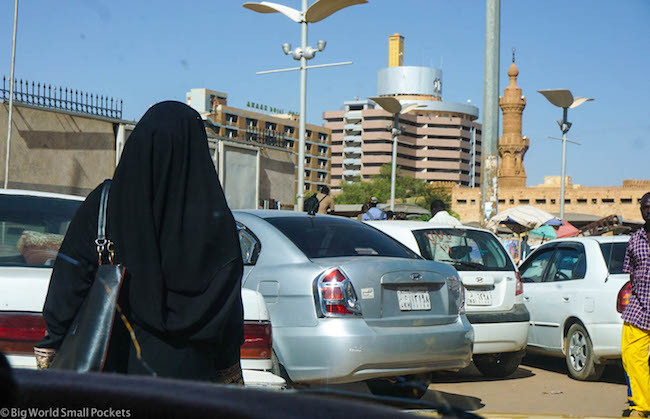 The difference between men and women travelling in Sudan however is the headscarf. While not necessary for foreigners to wear, I definitely found that adopting it made me feel a lot more comfortable in Sudan, simply as a respect for the culture and a desire to stand out in one less way. Being white, foreign, tall and alone brought me enough attention in Sudan (not necessarily in a negative way, mostly in a friendly way) so for me, adopting the headscarf while I was here just felt easier and more respectful. But back to my point about safety in Sudan. I think perhaps in part because of the strictness of the law and culture in this country (and probably the lack of alcohol), crime is incredibly low in Sudan. Honestly, I’ve rarely felt safer in a country – and definitely not in an African country – in my life! Even the capital, Khartoum, felt totally danger-free. So perhaps this has given you an insight into the answer to my question! 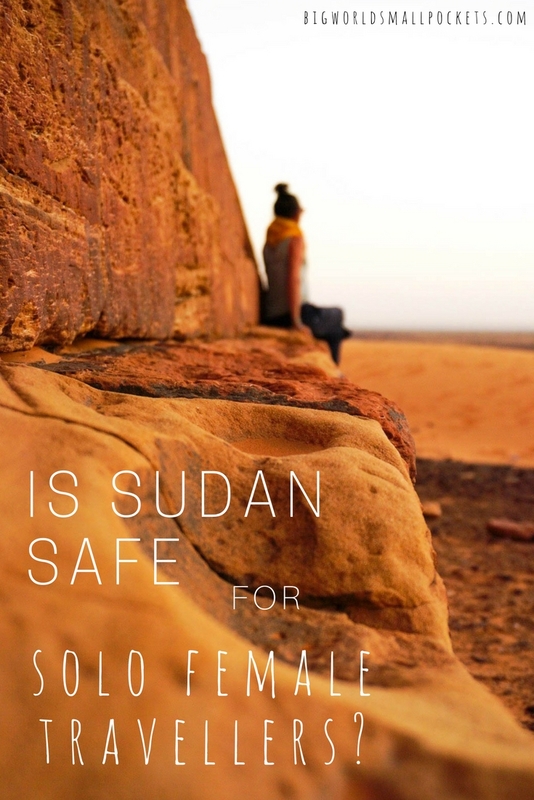 Because yes, Sudan is absolutely safe for solo female travellers, for any travellers in fact. Honestly the people here are the most genuine, helpful, kind, generous and hospitable I have met in my life. I literally think you could leave your wallet on the pavement and someone would come running down the street to return it to you. 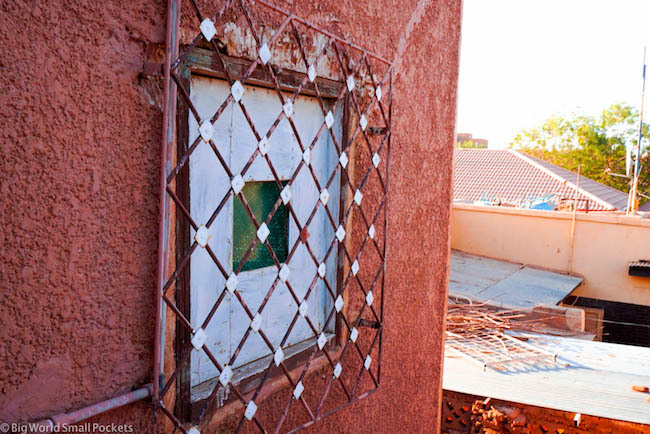 Untainted by mass tourism, indeed any tourism really, the Sudanese people are seemingly so delighted to have you visit their country, that you cannot walk 5 minutes down the street without someone inviting you into their house for a chat, some food or a tea. Throughout my time in Sudan I had shopkeepers who wouldn’t let me pay for my purchases, taxi drivers who balked at the idea of a fee and locals who bought my bus tickets and refused reimbursement. 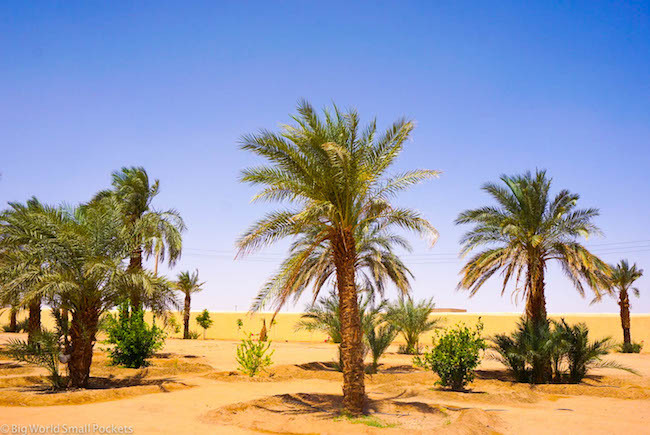 It seems hospitality and welcoming strangers is so deeply engrained in the Sudanese culture, that these people really cannot do enough for you. As a Westerner it’s startling and almost hard to believe! Our suspicions are aroused by such generosity, which is sad, because this is the real deal; a culture in which, ostensibly, one’s sense of worth really is derived from much you can help another person – wow! And I believe as a solo female traveller this level of hospitality is even amplified. We are such a rare entity in these parts that people will, literally and in every sense of the word, go out of their way to help you. 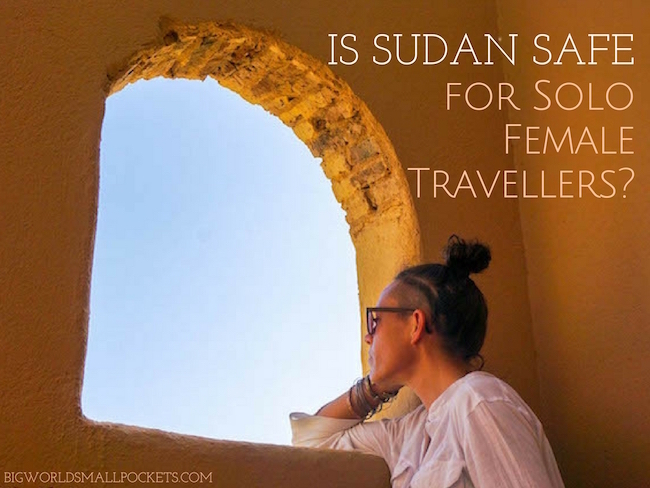 So is Sudan safe for solo female travellers? 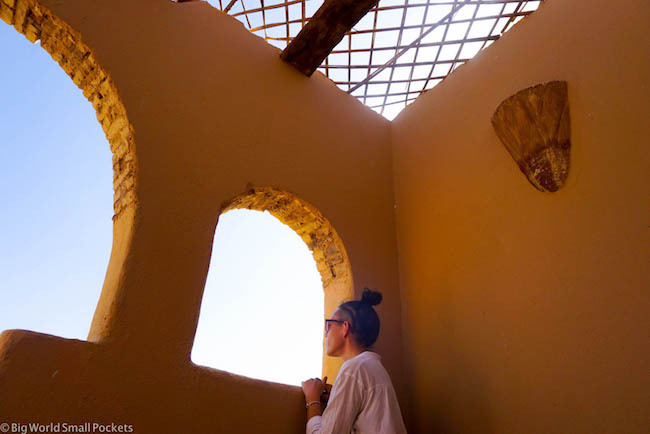 What you do have to prepare yourself for however as a solo female traveller in Sudan is a lot of questions. Firstly around where you’re from and what you’re doing in Sudan. Secondly, about whether you are married and have children. Thirdly if they can have your number! I presume this third question only occurs if you answer the second question with a “no”, but seeing as I don’t like to lie, I fell into this category every time! All this questioning in my experience is totally harmless, if not a little draining and, of course, due to the cultural differences, most Sudanese find it astounding that a 33 year old women would be unmarried and childless! If this a sore subject for you then prepare yourself! Still all these questions don’t make Sudan unsafe. As I said, these questions are harmless and mostly aired out of curiosity from a population who have very little exposure to the rest of the world. Even requested phone numbers are often just so people can practice their English and regularly I gave away my Sudanese number without fear or worry of doing so. Sure there are some local admirers, but solo female travellers are rare in these parts and any admiration should be taken as a compliment in my experience, rather than a threat. If there is anything the Sudanese people are, it’s incredibly respectful and friendly. 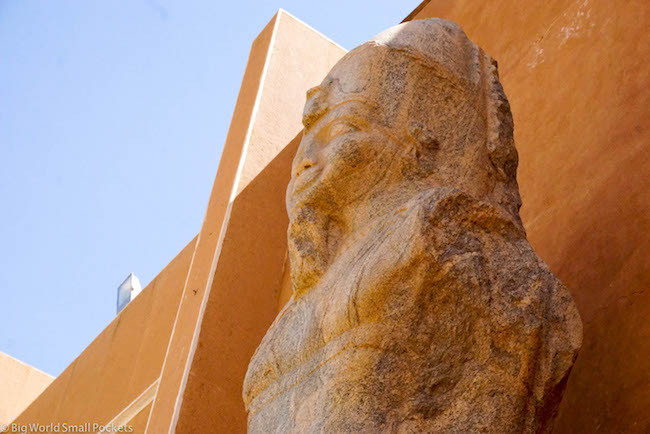 Pick up a company of the only guidebook currently published on Sudan, the Bradt Travel Guide to Sudan before you travel here. And as a final point to make on safety in Sudan, you’ll be pleased to know that currently the country is very stable. Free from civil unrest or war, politically (for a Brit at least) I felt Sudan was very safe. Indeed, my answer that I was from England generally attracted a very positive response of “nice people” and “welcome Sudan”. However, while the country is free from violence, you’ll want to note that the authoritative government here keeps a tight hold on censorship. 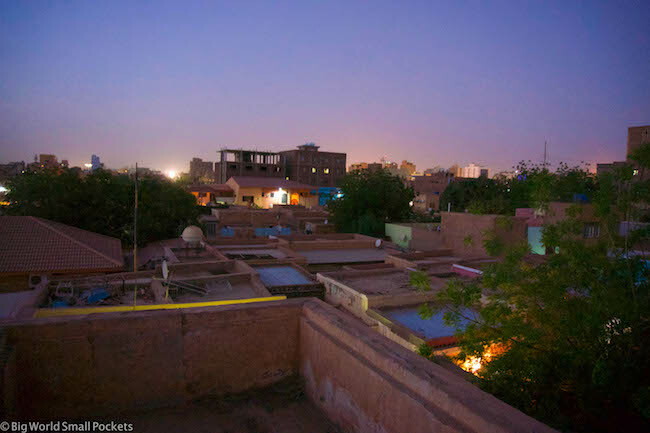 Within the travel and photography permit necessary for all travellers to obtain if they are leaving Khartoum, there are strict rules about what you can and can’t photograph in Sudan, so read these well and follow them to the letter if you want to stay safe in Sudan. It’s also worth reminding travellers here to be careful about what they post on social media and to refrain from political conversations or strong view points of this nature, especially in public places. But stick to these obvious rules and I’m sure you will find Sudan just as safe (and enjoyable) to travel in as I did. So in answer to my question “Is Sudan safe for solo female travellers?”, I’m hoping you’ve picked up my resounding answer of YES! 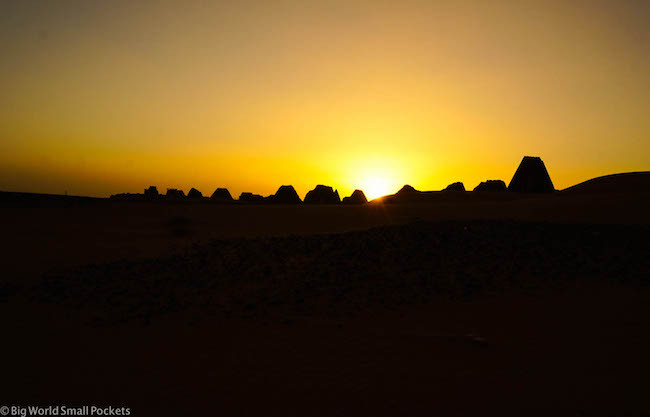 Showing respect to the local culture and engaging with the local people will great enhance your time in this country, in fact, it will make your time in this country, so please ladies (and gents) get Sudan on your list soon! You are so brave! And I’m happy that you did go to Sudan because the people seemed amazing and so happy to have you there. I’m not planning on travelling there, so many other places to see but this story made me happy nevertheless. Solo traveling is not an easy traveling. Solo female traveling very difficult. But i read your blog and really you share the info is very helpful solo female traveler. Good Work! I’m delighted that I found your blog. It is not easy found any information regarding travelling in the country so your blog is really very helpful. I’m going to go to Sudan in November and I’ll travel from Egypt. Certainly I’m travelling solo 🙂 I’m a little bit nervous about communication. I don’t know Arabic ( I’m going to start learning Arabic soon however I’ll be able to learn only a few basic phrase/words until my journey). So how would you cope with it? Or do you know the language? Hi Alice, great tip. I used Against The Compass a lot when I was planning my Sudan trip and found the site super useful. Just a heads up that it’s a guy though, not a girl! Hi there Steph, it’s so inspiring to read writings from a fellow female traveler. I am 17 years old and I want to become a photojournalist to shed a positive light on countries that have a one sided negative perception. I’m really glad to have found your page because there’s tons of blogs run by males that talk about how easy and safe it is to go to “off the road” countries–but they never seem to acknowledge that the reality of traveling is different for a woman. Just wanted to put it out there that I’m looking up to you, and I wish all the best.